Sometimes you can judge a book by its cover. Primitive Man are everything their projected image suggests – from the unsettling cover of their debut album ‘Scorn’, where a skull-faced human figure points a gun at the mouth of a bloody, screaming, helpless victim; to songs with titles such as ‘Rags’, ‘When Getting High Is Not Enough’ or ‘They Will Not Even See The Faces Of Their Killers Before They Die’ and even their band name itself, everything about these Denver, Colorado natives screams muddy, drugged-out, disgusting unpleasantness at you, which is precisely what they deliver with reckless, vicious abandon. Primitive, base-instinct evil and a very human sense of horror and dread slowly drips from their songs as if a mixture of mud, blood and urine is going through your ears. Sludge has long been a heavily misused term, appropriated by and attributed to all the wrong bands to a point that even iconic scene figures such as Mike IX Williams do whatever they can to distance themselves from it, but buried far beneath all the misunderstandings beats the true black heart of this very specific and very exclusive genre, and it’s to that drum that Primitive Man slowly dance to. 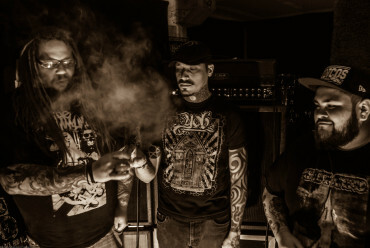 The spirits of Iron Monkey, Grief, Khanate or Eyehategod themselves haunt their songs, but like all true sludge, they do not define them. At their core, Primitive Man have their own unique identity, one that is still growing, as was patently clear in the terrifying noise tape ‘P//M’ they put out in 2013. Crucially, frontman Ethan Lee McCarthy also features in filthy grinders Clinging To The Trees Of A Forest Fire and crushing black metallers Withered, giving you a small hint of the several influences at play here. ‘Unable’, the horrendous nine-minute piece Primitive Man dredged up for this release, is almost like a showcase for everything you should fear about Primitive Man. Stare it in the eyes and don’t flinch when it comes for you.